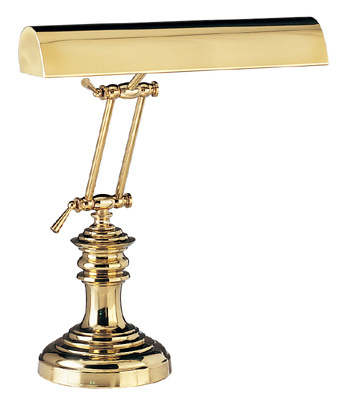 Bishop Base Antique Brass Piano Lamp is rated 4.87 out of 5 based on 47 ratings. Gracefully turned ripples of antique brass add interest and height. Circular base of this double adjusting lamp is 6.25" in diameter. Adjustable arm allows you to raise shade from 2" to an exceptional 15" tall. Double adjusting arm allows for wide range of adjustment for your personal lighting preferences. Shade adjusts on ball joint to aim light exactly where you want it.